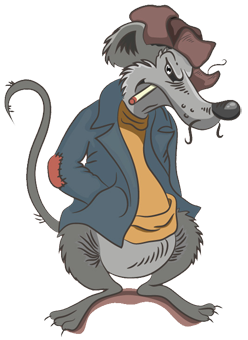 Our Anti-Rat & Vermin Non-Return Valve stops rodents and noxious fumes from entering properties via the sewage system. This valve also stops the backflow of effluent into properties. Simple to install into an existing manhole or soil pipe. No additional equipment required. WRc Tested and Certified with 5 Year 100% No Quibble Money Back Guarantee. Available in 110mm (4″) and 150mm (6″), we can supply only or provide a full installation service. Don’t fancy installing it yourself? Then take advantage of our installation service* @ £90.00 + VAT for the one and £45.00 + VAT each unit thereafter. This product is only suitable for inspection chambers less than 1.5m deep. Therefore we have assumed the manholes are no deeper than 1.5m, they are clean, clear and fully accessible. The Anti-Rat & Vermin Non-Return Valve is a Type 0 Anti-flooding device as per EN 13564-1:2002 (non-return valve) for use in residential and commercial lateral drains serving both single multiple properties. The valves typically fit clay and plastic 6 inch or 150mm pipes, to halt the back flow of water, rats, vermin and noxious fumes entering a property via the drainage system. The stainless-steel flap/ plate is manufactured to stop rats and rodents biting through it and provides a physical pest control solution. This system also is designed to prevent noxious fumes from entering properties. The unit has moulded polypropylene body, a stainless steel (SS430) plate in the flap and TPE fins and ring seal. 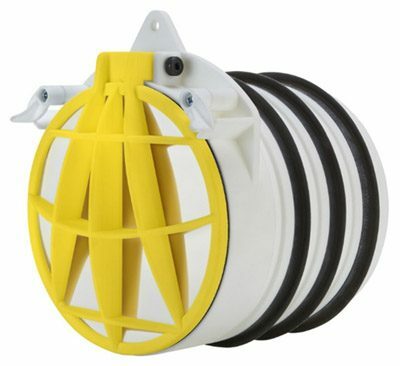 This is a retrofit device to fit into the outlet of 4″ or 6” clay pipes or to fit into preformed plastic manhole bases (in accordance with BS EN 1329-1:2000), located external to the building. 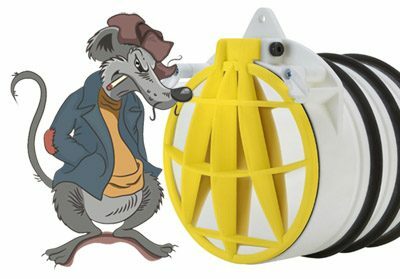 The Anti Rat & Vermin Valve automatically closes when backflow occurs and allows the normal flow when backflow ceases. In normal flow conditions the Anti Vermin Valve opens when there is a depth of water in the pipe on the upstream side of 50mm or more. Internal surfaces of the Anti-Rat & Vermin Valve are smooth. When installed in accordance with the manufacturer’s instructions, there should be a clearance of 2mm between the closure flap and the adjacent wall of the channel. ‘Universal’ means the valve able to fit both clay and plastic. The valve only fits in straight inlets to all inspection chamber bases. All rubber fins must be in the pipe, should any of the rubber fins are exposed, then the product is not fully engaged and therefore is not installed correctly. Forcing the product my cause damage.